Of those diagnosed with asymptomatic gallstones, it is estimated that 1-4% will develop gallstone-related complications per year . Common complications include biliary colic, cholecystitis, choledocholithiasis, pancreatitis, and cholangitis. Given these findings and the uncertainty facing many emergency physicians and general surgeons, the Tokyo guidelines were created in 2007 (revised in 2013 and most recently in 2018). This is a consensus statement created by an international committee of surgeons, internists, and emergency physicians primarily from Japan but included expertise from Taiwan, USA, Korea, Netherlands, UK, India, Italy, South Africa, Singapore, Greece, France, Argentina, and Hong Kong . This review only included one study looking at the effectiveness of CT which was done in 1979, and it found a Sn 94% and Sp of 59%. Unfortunately, when looking at more recent literature, CT appears to have a Sn of 39% and Sp of 93% . This is consistent with the message sent by gastroenterologists and surgeons alike suggesting that CT is a poor test to look for biliary disease. Despite this evidence, the current debate revolves around the utility of only using POCUS as the confirmatory imaging modality. Currently, in many centers including ours, the standard of care is to obtain a comprehensive radiology-performed ultrasound prior to general surgery referral despite having a positive POCUS. 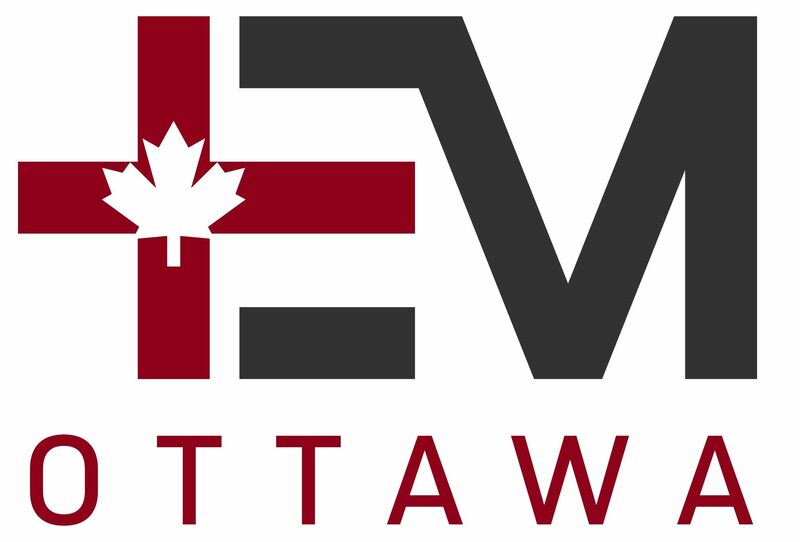 The primary reason appears to be a mix of medicolegal issues, consultant comfort with ED-performed ultrasound, and an already established standard of care and culture of practice. 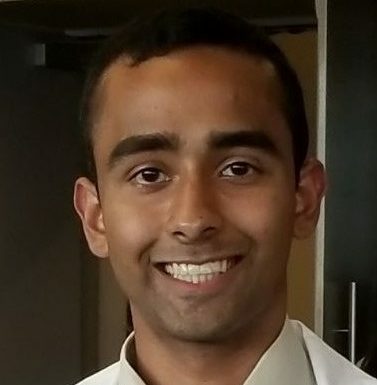 Thus, studies are looking at the efficacy of going straight from POCUS to general surgery without obtaining a formal ultrasound. A recent study looked at just this topic after reaching an agreement between ED POCUS physicians and general surgeons. Overall, they found a significant reduction in ED wait time by exclusively performing POCUS prior to disposition. 29% of all patients who had RUQ scans were referred to general surgery. Of the 29 % who were referred, 43 % got cholecystectomy . 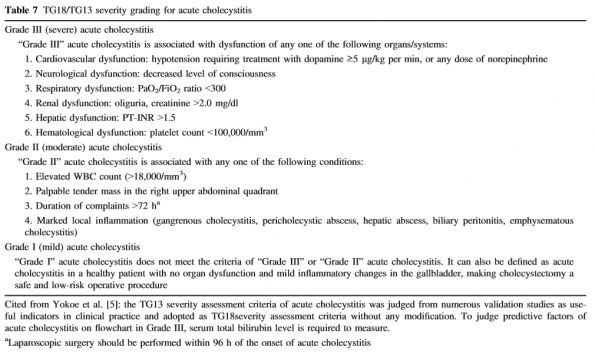 In the Tokyo guidelines once a patient receives a diagnosis of acute cholecystitis, the next step would be to risk stratify them based on severity . Often ICU patients with sepsis and without a clear source of jaundice. Patients often have numerous risk factors, most commonly an immunocompromised state. Approximately 10-20% of individuals having cholecystectomy will be found to have choledocholithiasis. Identifying these patients is often a difficult but essential task given the possibly deadly complications (i.e. pancreatitis, cholangitis). As above, these patients will often present with RUQ pain suggestive of biliary disease. According to these guidelines a high-risk patient has >50% likelihood, intermediate risk patients have between 10-50% likelihood, and low-risk patients have <10% likelihood of developing choledocholithiasis. Based on this the patient will undergo various investigations/procedures. Low-risk patients may go directly to laparoscopic cholecystectomy. 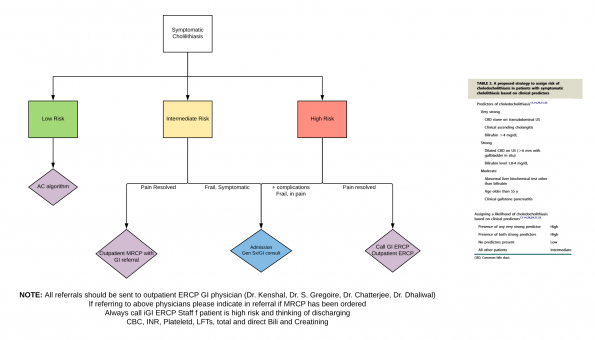 Intermediate risk patients may go on to have endoscopic ultrasound vs. MRCP prior to ERCP. 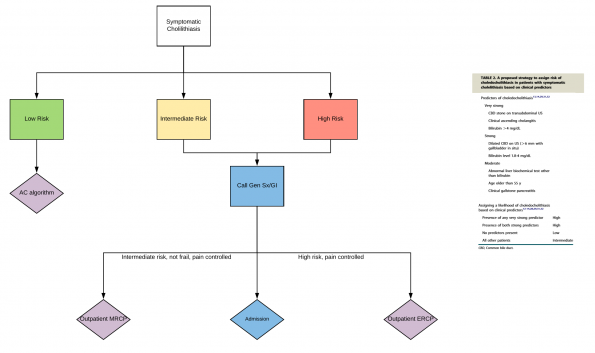 High-risk patients will often have ERCP. Unfortunately, in a recent study  looking at the accuracy of common algorithms for predicting CBD stones which included the ASGE consensus, the results were moderate at best. This suggests that the ASGE guidelines may help in ruling out the presence of CBD stones in certain populations but do not accurately predict the presence of a stone. 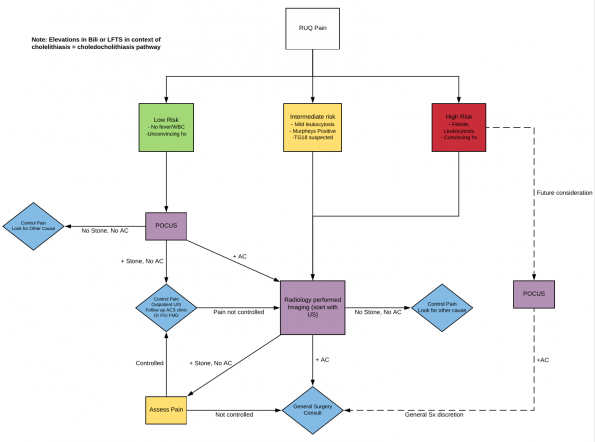 What about liver function tests? 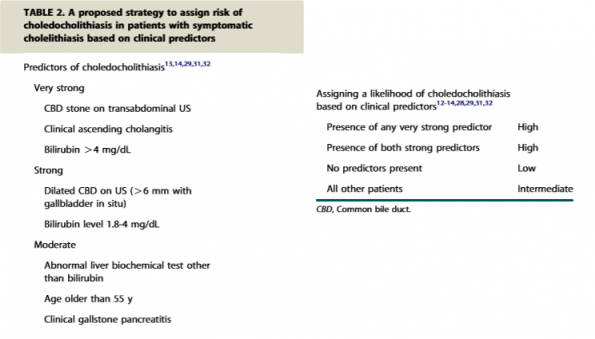 Can they help predict Choledocholithiasis? 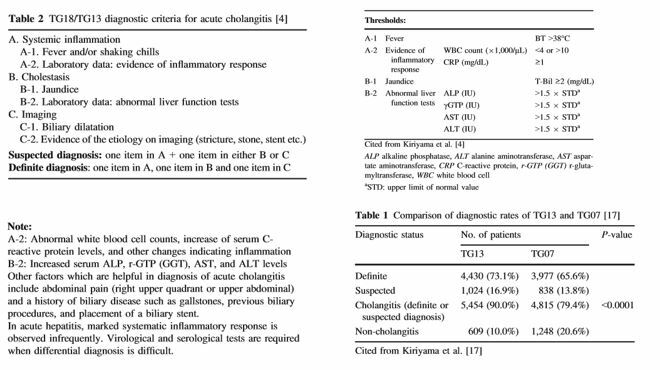 One of the most challenging aspects of dealing with biliary disease can be interpreting various LFTs and attempting to infer their diagnostic meaning especially when it comes to choledocholithiasis. Fortunately, there have been numerous studies looking to determine the exact accuracy of biochemical markers for CBD stones. In one retrospective study  looking at 1002 patients who underwent laparoscopic cholecystectomy, the values of 5 biochemical parameters that were measured preoperatively (GGT, ALP, ALT, AST, and total bilirubin) to assess their role in predicting CBD stones. chronic cholecystitis without CBD stone (CC – CBD). Acute cholecystitis was diagnosed based on TG13 and CBD stones were detected by ERCP or surgery. What imaging modality best detects CBD stones? There are numerous imaging modalities available to detect CBD stones. In the ED the most readily available are ultrasound and CT. As stated above, the consensus is that CT is a poor test to look at the biliary tree. Below is a summary of other available modalities and their accuracy in detecting CBD stones. NOTE: This is institution dependent. Please discuss with your hospital for local practices. We highly recommend speaking to GI before sending any patient home who is at intermediate or high risk for having CBD stones. There is a role for talking to local experts before sending patients home who are stable and pain-free to arrange prompt GI follow up in 1-2 days for investigations. Cholangitis is inflammation of biliary tree most commonly caused by bacterial infection due to biliary stasis or obstruction. The most common cause of cholangitis is gallstones, but other causes include primary sclerosing cholangitis, benign biliary stenosis, and malignant disease to name a few. As stated above, the diagnostic ability of ultrasound is limited in assessing the common bile duct. Given that patients with cholangitis will often present to the ED with some form of hemodynamic instability it is the opinion of gastroenterology and general surgery at our center to obtain a CT scan first to rule out other intra-abdominal causes. Bellows, C., Berger, D., & Crass, R. (2005). Management of Gallstones. American Family Physician, 72(4), 637-642. Noble, V., Nelson, B., & Sutingco, N. (2007). Manual of Emergency and Critical Care Ultrasound(pp. 136-151). Cambridge University Press. Shekrachi, B., Rafsanjani, S., Fomani, N., & Chahardoli, M. (2018). 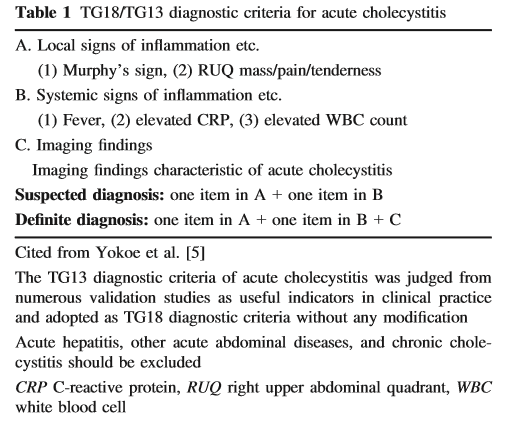 Emergency Department Bedside Ultrasonography for Diagnosis of Acute Cholecystitis; a Diagnostic Accuracy Study. Emerg (Tehran), 6(1). 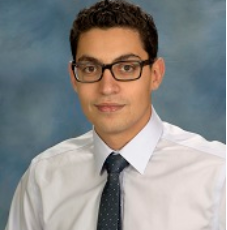 Dr. Haroun Zayed is a PGY3 CCFP-EM resident at the University of Ottawa with interests in POCUS, rural medicine, family medicine, and health administration.